May: Children’s Book Week Giveaway | Portraits of M.E. May Children’s Book Week Giveaway!! This winner has been notified by email. If there is no response within 48hrs a new winner will be chosen. If you are interested in winning this book, Witch Twins at Camp Bliss by Adele Griffin, then you want to enter this month’s giveaway. Entering is simple, just leave a comment (mandatory to enter) and you could be the lucky winner! Want more than one chance to win? Like my Facebook page, follow this blog, or follow me on Twitter, (these are optional) and you just upped your chances of being chosen! *** Don’t forget to LOG YOUR ENTRIES. I’m using Rafflecopter to collect and choose a winner. The winner will be chosen at random and announced on Tuesday, May 15th. Check back to see who won! This month’s giveaway is in honor of Children’s Book Week, and is hosted by:KidLitFrenzy, Classic Children’s Books, Mymcbooks, & I Am A Reader, Not A Writer. 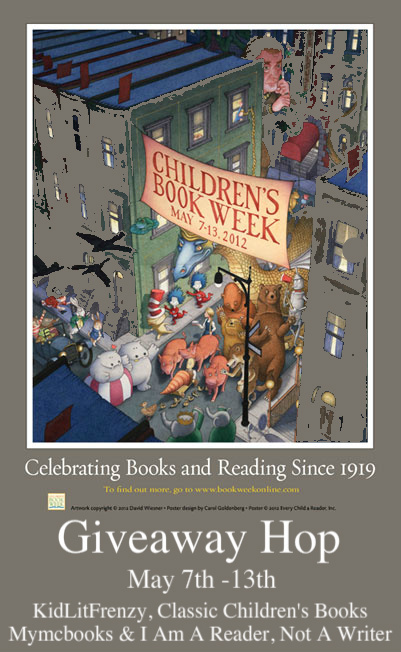 Children’s Book Week was established in 1919, and is the longest-running literacy initiative in the country. Each year, books for young people and the joy of reading are feted for a full week with author and illustrator appearances, storytelling, parties, and other book-related events at schools, libraries, bookstores, museums, and homes from coast to coast! Thanks for the giveaway, I would love to win. Thank you all for entering. I know you’ll enjoy this fun story. Just a reminder to those who haven’t done so – in addition to commenting here, you’ll need to log your comment by clicking this link: https://www.facebook.com/MHerrera2nd/app_208195102528120 This way I can choose a winner at random. Thank you for this awesome book giveaway. This looks like a fun book. I always loved camp as a kid. 🙂 Thanks for the giveaway! Thank you for such a neat book giveaway! It looks good! Right about my daughters alley. She would be delighted to have it in either print of kindle format! Thank you for the giveaway. Thank you for the giveaway! This sounds to be something my children would read. Great story! Thanks for the great giveaway! My daughter would love this book. Thanks so much for the giveaway. My kids would love to win books. This looks like a fun book for my daughter. Thank you for the chance to win, and know more about this book. I added it to my TBR! My daughter would love to read this book. Thanks for the giveaway! My stepdaughter would really enjoy reading this book. Hi Everyone, thank you so much for entering May’s giveaway. The winner has been randomly chosen and announced in this post and on Facebook & Twitter.